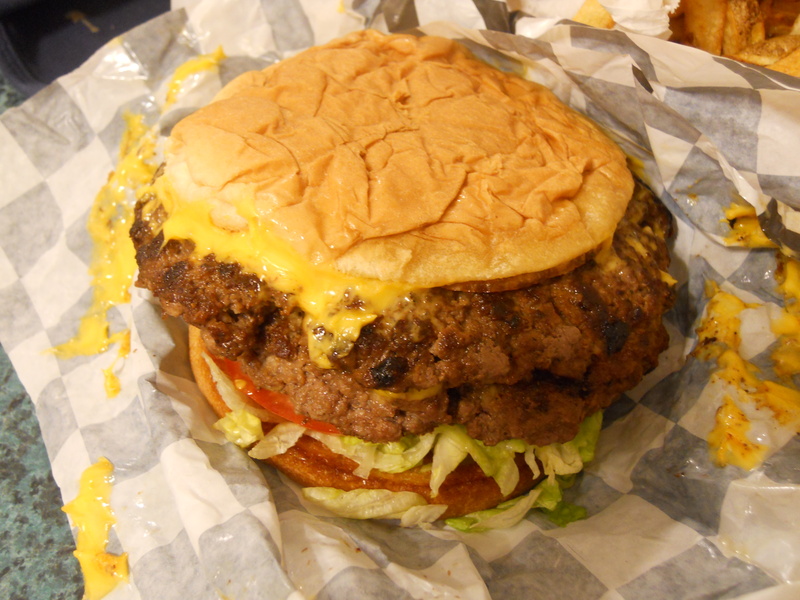 Bionic Burger is right up there with Nu-Way when you talk about iconic burger places in Wichita. They have been in operation for over 30 years and currently have four locations in the area. Luckily for us, the newest location on East 21st near Woodlawn is rather convenient when we are in the mood for a fast and tasty meat disk. The menus at all four Bionic locations are essentially the same and quite expansive for “just a burger place”. They offer several different burgers, plus a who’s who of classic comfort foods including: a pork sandwich, hot dogs, chicken fingers, grilled cheese, chili, o-rings, etc. Shakes and malts are also available in case you have any room for dessert. On this visit I was feeling bold and decided to go with the Six Million Dollar Burger along with some of their fresh cut fries. I was under the impression I would be getting a half pound cheese burger with some veggies, instead I unwrapped a monster. Apparently when my sister had placed the order at the drive thru, she had ordered a double, leaving me with the most intimidating 1lb burger I had ever laid eyes on. The first order of business was to bisect this mass into edible pieces. Once that was accomplished I was able to enjoy this pretty solid burger. The patty, while a bit thin for my liking, was properly seasoned and surprisingly juicy. Plenty of gooey cheese, lettuce, and tomatoes were icing on this protein based cake. Sadly the bun was not quite up to the challenge of supporting all of this deliciousness. After a few bites, it quickly deflated and broke into pieces, no doubt the victim of too much grease and the basic principles of physics. I pride myself in being able to finish just about anything I order at a restaurant, but it was not happening on this day. I doubt whether the bionic man himself would have been able to finish off this bad boy. Did I mention the burger came with a far too generous serving of delicious fries? These thick-cut, crispy fries were top notch. For a quick burger you can’t go wrong with Bionic Burger. Their large portions and tasty food is tough competition for any fast food joint in town. Your sister is evil! lol! My hubs used to always get that one but I just can’t do it. I usually get the mushroom swiss burger. I used to hate their fries but they’ve improved a lot. Yes, she has lost her food ordering privileges. Wanted you to know that I am always glad to see your name in my inbox. I really enjoy reading your posts. I like it that you honest but not mean. You always have good information and it is as if we are there with you. Last, it is obvious you are having a good time and I appreciate being able to come along with you. Thank you. Thanks for the kind words. My goal is to be as fair as I can and perhaps intrigue the reader enough to try some new places around town. There are still plenty of restaurants out there for us to blog about! 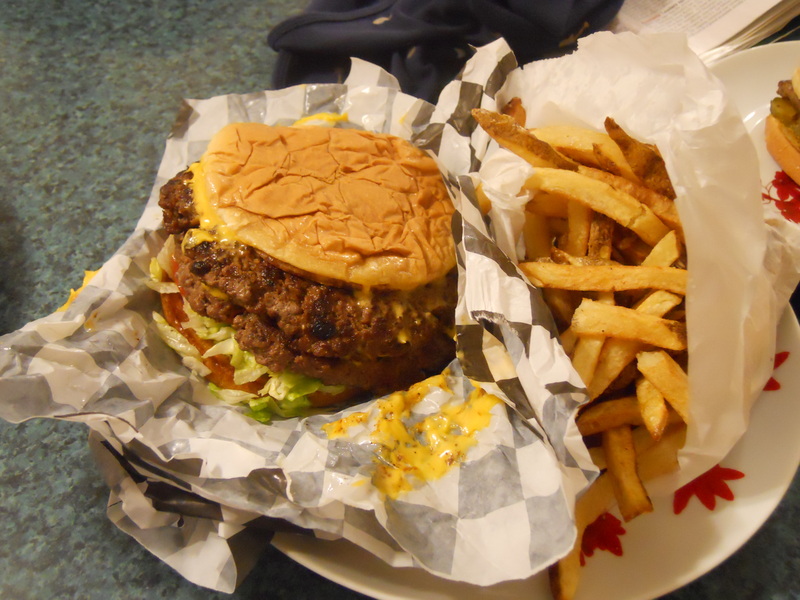 I just ate there too and think they are one of the best burger joints in town.I do think it is odd that you have to pay extra for normal toppings like lettuce and cheese, but I don’t mind since the food is general pretty good. They just need to switch out the styrofoam and I’d be so happy!! Thanks for posting about this great local restaurant. When I interviewed in Wichita in 1992, My future boss took me to the old Bionic Burger on E Harry St. We moved here, and Bionic Burger has been a part of our Wichita story. While the Harry St. location is long gone, we try to make it to the other locations every once in a while.